Ugh we got the CUTEST thing in the mail from VIKTOR & ROLF - this 10th birthday celebratory collection of TEN little mini-mini FLOWERBOMBS. 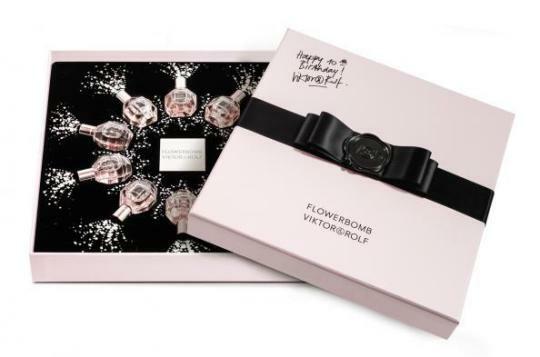 I personally love this fragrance more conceptually than I do personally (in other words, I appreciate its iconic status and I understand olfactively why it is so special …), but I bet a lot of you wear it since it’s a mega-hit, so we figured we would give this away! It has a $130 value! So tell me in the comments (click through to www.cultofpretty.com and scroll to the comments section, don’t send in Tumblr) - what are 3 NEW MUSIC ARTISTS YOU THINK ARE THE BOMB. I admit this is selfish - I need new playlists : ) Winners will be chosen at random. Open to U.S. residents only. You must be 18 or older to enter.